It has been a good year - I started this watchblog in feb. 2009 - And had almost no hits or visits the first two months. But that has changed. I now have over 10.000 people visits my site each month and the number is climbing (December was a little slow - also due to the fact that I did not update my watchblog that often), but I expect to have about 20.000 visits in first quarter 2010 - thanks to you all. But I have hits on my site including my photos of over 100.000 pr. month.So that is very nice. Can even see that my photos are used on "wiki" - so that is nice. I plan to continue my little watchblog.dk in the same format - "keep it simple" - and hope to have time to more articles on what I find interesting. I plan to do my article on what I see as Iconic watches, with as much information as possible. And thanks for all the mail I receive, I hope I have replayed to you all with information you could use. Next I hope to add a new watch to my little collection in 2010 - maybe even two watches - but time will tell. Stay tuned for 2010 - And let it be the watch year for us all. To round up - Here is my SOTC (State Of The Collection). Same collection as last year - now new addition for the last 2-3 years. I hope to add a Deep Sea and a Daytona in time. And a 5513 is always welcome. 2009 was the year where I found a very nice Panerai 1B - one of the classic panerai watches - that I will keep "forever". But then again I don't plan to sell any of my watches in the near future. I have the two watches I like, the Pam 1B and Pam 25C. For now this is OK - no need to add any other Panerai in the near future. But as always - if the right deal is there I might change my mind. I "found" my first real watch - my Heuer professional 200 meter. That is really a nice watch - and it brings back many memories from my time as a scuba diver in the cold danish waters. This watch has seen the world. From the north of europa to the north, east and west of africa. It is time for SOTC (State Of The Collection) - Or What watches are people collecting. We are coming to and end of 2009 and it is the time where many people look back at the year and think about their life and what they should focus on in the new year. 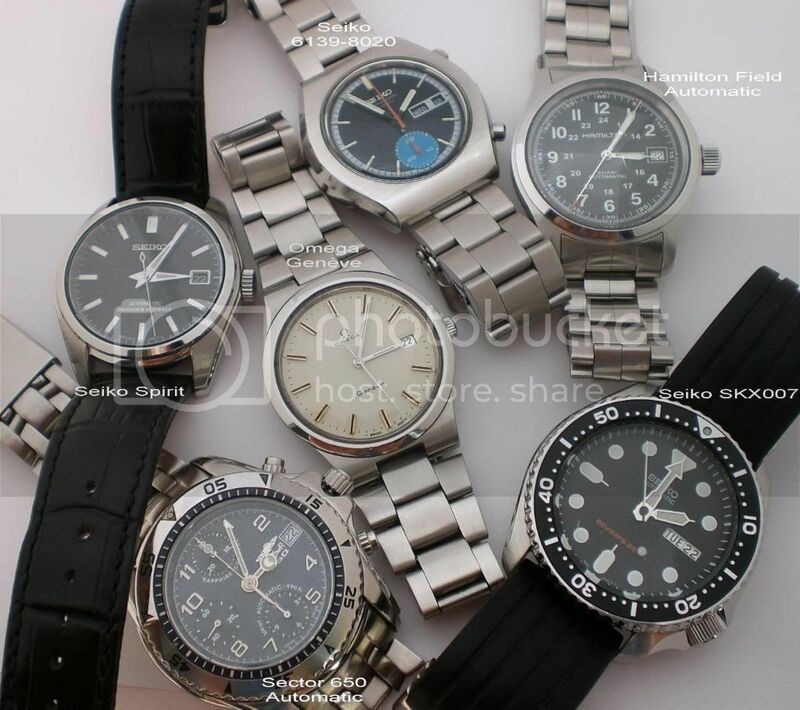 But it is also the time for "SOTC" - State Of The Collection for many watch collectors. How does their collection loog now, what have left and what have been added. I enjoy looking at other peoples collections, and what is really like is collections that is not of the high brands only. I have found some few SOTC photos on timezone.com. Their exist many different kind of collecting exist around the world. Here are some photos of peoples collections that is very nice but also very different. How about some micky mouse watches? And this is a collection I like - Not expensive but very special. And how about many different watches - I don't even know many of the brands. And mannnnnnny more exist - But I must say that it is always fun to see other peoples collections. The most beautiful watch !!! Well it is all in the eye of the beholder - but I have some watches I think of when I'm asked about the "most beautiful" watch. I like the "simple" design - and something that has proven its value over time. The first one is a very of-limit watch for me - the price is so high that I have to win the BIG lotto price just to start thinking about this watch. Why rolex have not made this a standard version I don't know - it really is one perfect watch. The next watch I would like to highlight is the simple original Panerai model. Either with or without the seconds hand at 9 o'clock. Somehow this watch gives me a flash back to the "old" times. And I feel the design still is the BEST from panerai. There are other watches I think have hit just right on the design - but I must confess that many newer watches don't give me the same feeling. Will I ever own a gold watch - Yes I might. Yes - I must say that as time goes by I'm more and more inclined to get myself a gold watch. Maybe not in the next 5 years but I could see myself with a nice gold tool watch in the future. But which model should it be, I have my short list ready. Here will follow my small description of each of the models I would like and the pro and cons on why I feel that one of these gold watches would fit me. I do have some other models on my next watch list that I would like to have before - the Deep Sea and a Black dial daytona. I do think that the black dial daytona is what I will save up to next. But here is my list of gold watches I like. Vintage Rolex Gold GMT - nippel dial - somehow understated class. Rolex Gold Sub - It's a Rolex - and they do look good and will forever be a classic. AP Royal Oak Offshore - Gold model - maybe a little over exposed but it looks good. .. and maybe some others, but these are my main list. Ok - so Rolex is a little overrepresented - but when going for gold - I vote for a classic model. I have a friend that found a beautiful rolex gold gmt vintage model. That did extremely nice, and one I would say really looks like understated class. Clint Eastwood have always been "known" for his Rolex GMT in gold - the so called Root beer model. But the Clint have now been seen with a Lange watch. Maybe ok for a man of his age - but I for one will always remember the rolex root beer as the watch own and used by the "Clint". There is and will continue to be many Rolex myths floating around. Some is more special than others.. It was not a rolex but a smith watch that was first on the summit with Hilary and Tezing. One thing that I almost certain on is that A rolex was their as the first solo climb to Everest and the first climb without use of extra oxygen - both was done by Reinhold Mesner - and he was know for his Rolex Oyster Quartz watch. We all know that the Omega Speedmaster is the Moon watch, but there is still some open issues on if a rolex has been on the moon. It is almost sure that rolex has been in space, but the final verdict on if a rolex has been on the moon is still open for talks. Which was is the REAL James Bond watch- well it is a Rolex, and after the latest information it looks like Ian Flemming had a Explorer himself and that was probably the watch he "gave" James Bond to wear. The next best thing is the rolex watches used in the first movies - Rolex submariner in different models. Paul Newman has given name to the special Rolex Daytona models with a special dial. There has been many throughts about Paul Newman wearing that special Rolex daytona in the movie "Winning" - but that have been shoot down - but it is clear that PN does wear the older model of the Rolex Daytona also with exotic dials. The verdict is still out - but I don't think any vintage rolex collector would buy that watch. The many things uncertain about this watch and the unknown history makes this watch a don't do it for the majority of people collecting rolex. This is a known story - that Che was wearing a rolex GMT model (model 1675) - as seen on many pictures. And the watch should now e in the possession of the USA CIA man (Felix Rodriguez) that was on the place where Che was executed/shoot. No real pictures of the watch exist after it left Che wrist. But the story should be OK. I for one would love to see the value of this watch when it hits the auction. This watch would I really like - it has one great story connected to it - but the price would be to high for me. The Rolex Steve McQueen is the Explore II model 1655 - the very special rolex tool watch - made for the speleologist that explores caves and need the extra 24 hour hand to tell if it is night or day. This watch was never a big hit for rolex - and when you view this watch beside other rolex models, you can easy see that this watch is something special for rolex. The dial, the hands, etc. All in all this watch is one of a kind. I hope that I some day can add this to by family as the more I see it the more I LOVE it. But back to the Rolex Steve McQueen - he was never seen with this model - the Rolex I would match with Steve McQueen is the Rolex Submariner 5512. A icon as well as Steve McQueen. And the price on the auction for his own 5512 was very high - much higher than expected - but a fair price I would say. Many other icons exist - the milsubs, the day-date, etc. But this is what is so special about rolex watches, they continue to give us many stories and we can continue to talk about this over and over. Be aware of fake dials on especially vintage rolex models. 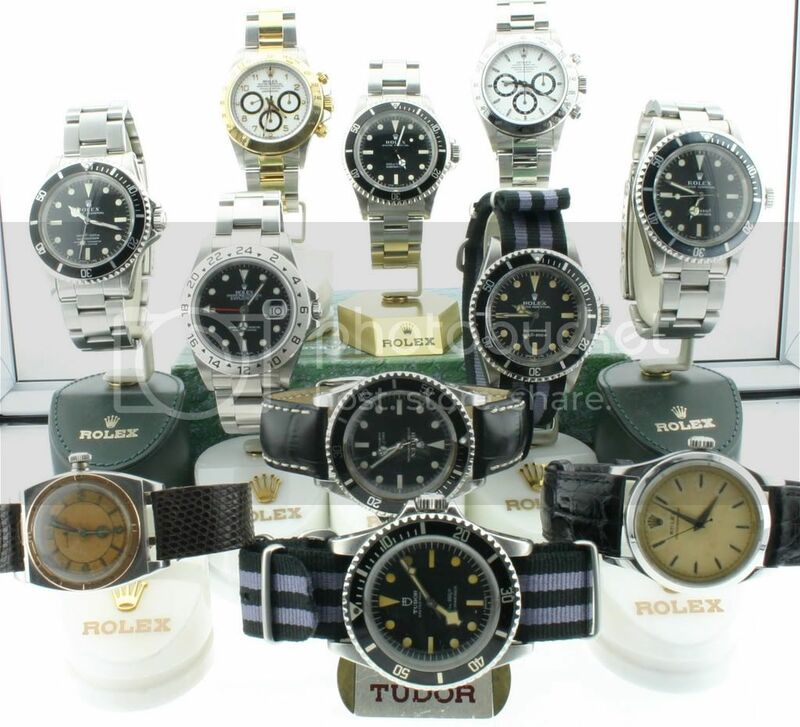 As time goes and the prices on selected vintage rolex models are on the raise I have a number of rolex models I would only buy from very well known sellers. And when it comes to these watches the saying "buy the seller" is never more true. With the fakes becoming better and better all the time, one must be very careful when paying a premium over the normal price - meaning you pay extra for the version of the dial. The watch could be 100% ok - but put a "fake" /re-done dial in and the price might increase more that 100-500%. Below is the list of watches I would be careful to checkout more than twice before spending the money, and again ONLY buying for a know and respected seller! Milsubs - a normal 5513 with a T on the dial - >1000% increase !! Comex subs - 500%-1000% increase !! Many others .... Be careful!!! My Next watch is in the pipeline - I have decided on a Linde Werdelin after many thoughts back and forth. I will go for a Linde Werdelin watch - I have been walking around this brand for so looong. If I don't get one sooner than later I will forever think about it. Almost the same as when I toke the step into Panerai. I did that after many pro and cons, but have not regretted it ever since. My little visit to Linde Werdelin R&D in Denmark also made had some impact on the quality of the watch, something very difficult on watches almost only available over the net. The version I'm on the lookout for is the Elemental or Two-timer, the watches from their "original" collection. Now I hope to be able to find one - if not I might have the get a newer model - "The One" would do fine, and if money was no problem - "The Octopus" would also do nicely. Have been at my new work for 3 weeks now - No other "WIS" in sight! As some of you know I have started on a new job the 1 December 2009. This is also why the blog have been a little thin this month. Well after these 3 weeks - I have been around the business from top to bottom, but have yet to "find" a person with a watch that "might" indicate a WIS. So lets make a simple poll - how many people besides yourself in your present job is a watch collector/WIS. Don't count you self in - just the number of other persons. Based on my findings - I would say a real watch interested person is 1 in 200 or even less. Christmas is close - anyone getting a watch for themselves and putting it under the tree? In this sweet time of the year - where we get together with the family, eat good food and give presents and dance around the Christmas tree. You think about other people, give presents..... but how about a little watch present for your self. We as watch "freaks" are seldom "understood" by the family - why is one watch not good enough? Well you all know the stories. And with the prices of the watches some of us is looking at - the chance of the wife making a surprise buy of a Rolex (new or vintage), a Omega Speedmaster cal 321, a Linde Werdelin or any other watch you have on your own next watch list is so slim I would say it does not exist. My question to you is - would you buy a christmas present for your self, wrap it and place it under the tree to be unpacked around the family? Well to tell the truth I would love to do it - and I will do it - but just not this year. Here are my "Christmas Presents" for me if I had to select right NOW. Rolex / Tudor - "The Sleeping beauty"
This "brand" have somehow always had my focus. It is not a "real" Rolex it is a real Tudor. But I have not given the brand brand my full attention.Something I might change in the near future. 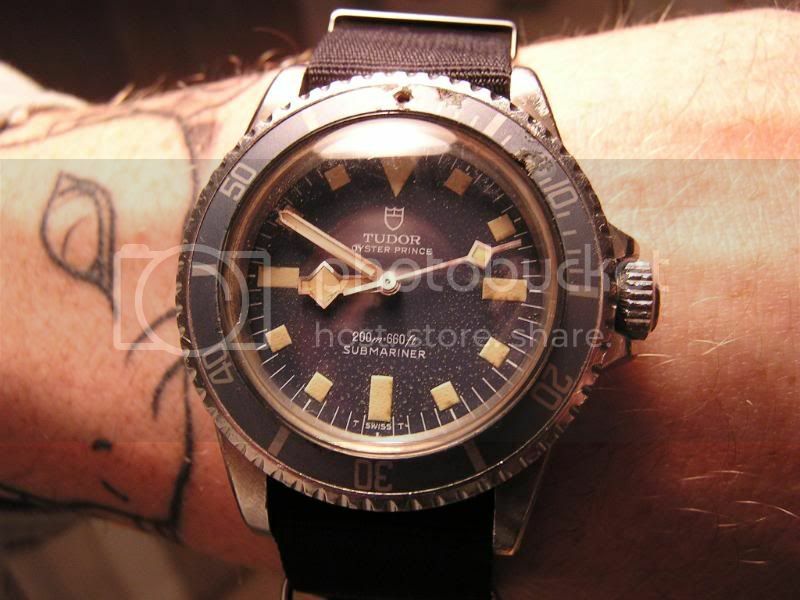 The Tudor watch I have had my eyes on for a while is the Tudor mini submarine. That would be the perfect watch for any girl. I have seen it on one, maybe two girls during my many years as WIS.
And I most say that this mini Tudor Sub is most perfect girl watch - nothing else comes close. I would love to have the Tudor Submarine Snowflake (Marina Nationale). That is the mini "Rolex MilSub" of Tudor. Used by the France Marine in a period of years - these watches have become more and more valued over the years. And finding one that is a real Marine Nationale model (with caseback inscriptions) is nothing for the beginner in watch collection. The value of these watches have become so high that fakes are "easy" to make and impossible to tell apart from the real thing. For sure Tudor watches are a sleeping beauty of the watch world. But not for long. John Meyers interest in watches is "well known" in the vintage Rolex world - John Meyer even has a dial named after him in a watch auction catalog. Read this short story here - it is OK to read and gives a view of his interest in watches. “When I started to make a little bit of scratch, I thought it was time to get a Rolex,” he said, recalling the swagger with which he picked the Explorer II, with a white face. Although buying it was a marker of success — like his first Grammy, which he’d won for “Wonderland” — it wasn’t long before it was not enough. “I get very into something. I want to research it and check it out,” he said. “The Rolex was just kind of the first rung on the ladder. I remember people saying, ‘Oh, Rolex is all right, but IWC makes a great watch. Audemars Piguet makes a great watch.’ So I go, ‘What’s IWC?’ ” .. ... Let the questioner beware: Mayer can tell you more than you ever wanted to know about how few special cross-branded Rolexes were ever made. Still very busy with my new job, so updates are less often than I would like I'm sorry to say. How about a beautiful watch - like a Panerai - not a copy but cheap. Well as I have said over and over again - buy the real thing - buy what you want. Do settle for second best. Buy what you want. That is why I would NEVER buy a fake watch. I don't want to compare it to "love" but you know the feeling. I there is one love you what go for it - if you settle for second best your mind will forever be on the one you did'nt get. And in the case of watches - I would never buy a fake Panerai, but I would have no problem buying a watch that could have the same feeling. And I found this extremely nice looking watch, somehow I really like it - it is no nonsense, clean, to the point and "looks" like OK quality. And I must say that my initial feeling on this watch is very positive - but remember I have not seen it or tried it on. Sometimes photos can be very good, but in real life the quality is not up to the standard you would expect. I had this feeling with another brand - Linde Werdelin - there I had seen many photos of the watches, but never handled one in real life. But after trying them on, seeing them in real life I was positive surprised. Other brands have made me feel the opposite - the photos looks very good, the watch looks of high quality, but when I get the watch in my hand - all falls down, the watch is no where near the expected quality. But this "new" brand - magrette - could be a positive surprise - and for the price . you have nothing to loose. I'm not even sure you can make these nice watches for the price they sell for - but hey - why not give it a try. I for one will NOT forget this brand. Respectful and highly recommended net-watchshop. Just to let you know of a super guy that has started his own watch netshop after being partner in another well respected online watchshop. 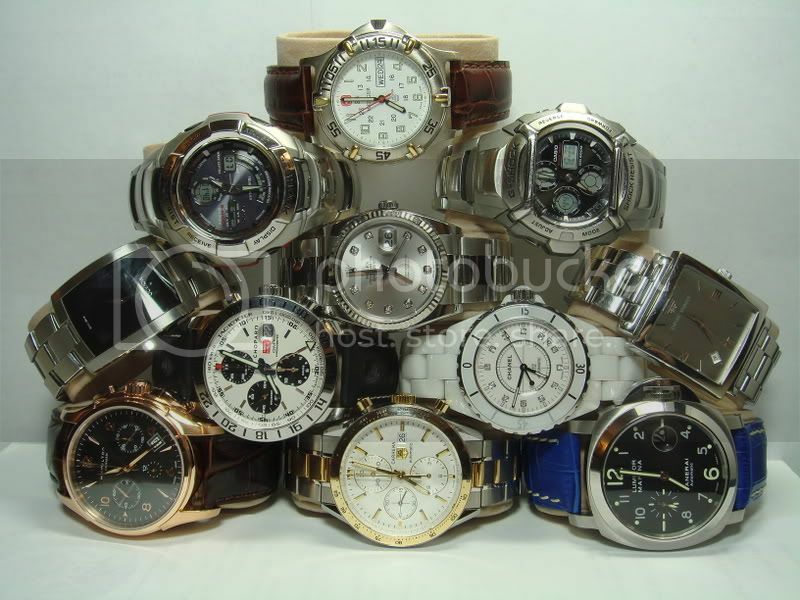 I can only recommend Alex's new watchshop with his focus on new watches to a good price, his ability to find used watches at a very reasonable price and last but NOT least when dealing online. I can say that you will be treated very well and he will do his best to give you a super service. Check out his watches both new and old, and of many brands. But mainly he has watches that any watch "freak" will find very interesting. I for one keep his watchshop in my bookmarks and check it out weekly. If only I had the money I would know many watches I could get for my small collection. Collecting watches - collecting stamps - same thing? Somehow I can see that "collecting" watches and collecting stamps are close related. I'm not a stamp collector but..
People collecting watches tend to stick to brand to a start, same as people collecting stamps tend to stay with one country. But then some stamp collector are into small difference in the "same" stamp, maybe some very minor difference in the printing. 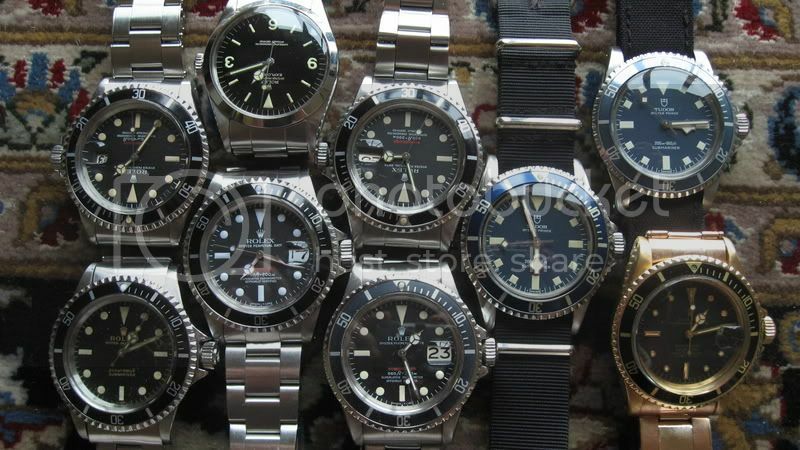 Same as for people collecting watches, some find it nice to have the same model with different variations in the dial. So after all the difference between people collecting stamps and watches is probably less that one would expect from a start. Only the watches are a little more expensive ... Well not always, have heard of stamps that cost the same or more than the watches I like. So even if stamps are for needs - we might be in the same league - I also find that not all can see the "fun" in watches, the same as I do. So respect to all collectors from me. Well november was again a new record. Over 10.000 visits and 1559526 hits!! Guess the number of hits is due to my photos around on the net - but nice anyway. Again I would like to say thank you to all the feedback and positive emails I recive. How do/did you "collect" your watches. Most of us that have more than one watch and keep looking for the next one. I have my own ideas and focus on what watches I would like to "have". My focus have been on brand, model and history. So if I had to sum up how my little collection have evolved over the years. My first "expensive" watch - was my Heuer diving watch (a quartz model). I would have loved a Rolex but the price was a little in the high end fore me. But I still checked, got brochures and loved the Rolex ads in the National Geographic, but I was still dreaming of one day owning a Rolex. Then came the date in 1985 when I got my first Rolex. The Explorer II (16550) and was not planning of getting any more. Now I had the Rolex I had dreamed of. The second Rolex came after the birth of my daughter - I got the watch to "remember" the day and also because I did want a Rolex Sub. That's when I got my first used Rolex Sea-dweller 16600. Now I was started on a small collection - I now had my two rolex watches and had got the "bug" now. I started to look around on for other rolex watches. The next watch was again a Rolex - When the Rolex 50 years Rolex Sub came out - I was put on the waiting list, and after 5 month I received the call that the watch was ready. And I became the lucky owner of a brand new Rolex Sub 16610LV. Well my focus was still Rolex and only Rolex - I did talk to some with Panerai watches - but they did sing to me. And I will not buy a watch without it sings to me. But I started to look at Panerai watches from time to time - but now I had the vintage Rolex bug, and wanted to find a sub 5513 from my birthyear. I did find a nice 5513 but nor from my year. But after I got the 5513 I was hooked on vintage rolex. 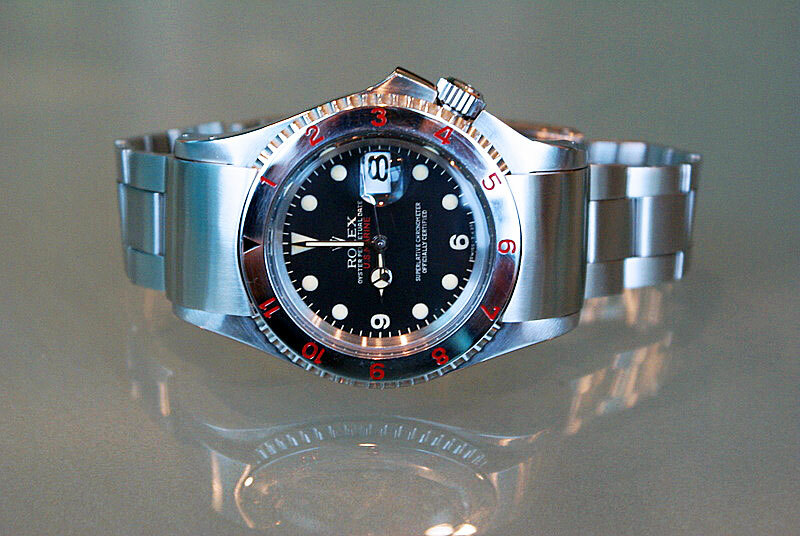 I did a lot of searching for a nice 1680 Red sub - but the price was a little to high (well not compared to now). After I got my 5513 I "relative" quickly found a super nice GMT 1675 with pointed guards. Then came the "crown" of the different vintage rolex - the Great white Sea Dweller 1665. This I still see as the best Rolex design. They really got it correct with that watch. The came the last vintage Rolex - the White Sub model 1680 - and I say my collection as complete. I had the watches I liked - Did not find that I needed any other watches. I was DONE. After a short period of being content with my modest collection - I had started to visit panerai forums and started to think that it might be something for me - but I was not really sure. I did not like the flashy steel models to a start - the bigger size of a Panerai watch made me want a more stealthy look, so I went with the PVD models of Panerai - the Pam 4B. Well after the Pam 4B I started to check out some more Panerai models and began to understand the community around Panerai, something very special and what makes this brand so unique. It is not easy to say how this community started or kept alive but somehow it does. Next Panerai watch was the Panerai 25C - the dive watch of panerai in Titanium - so it still is a little stealthy. This has been my daily watch for next last years on and off. But somehow it just feels right. Now we at at my last watch addition - again a panerai. The Panerai 1B - a "classic" version of the Panerai series. So far this is my "last" panerai - I think - but there does exist some Panerais I would love to have. But then again I find that there is also other watches out there I would love to have. 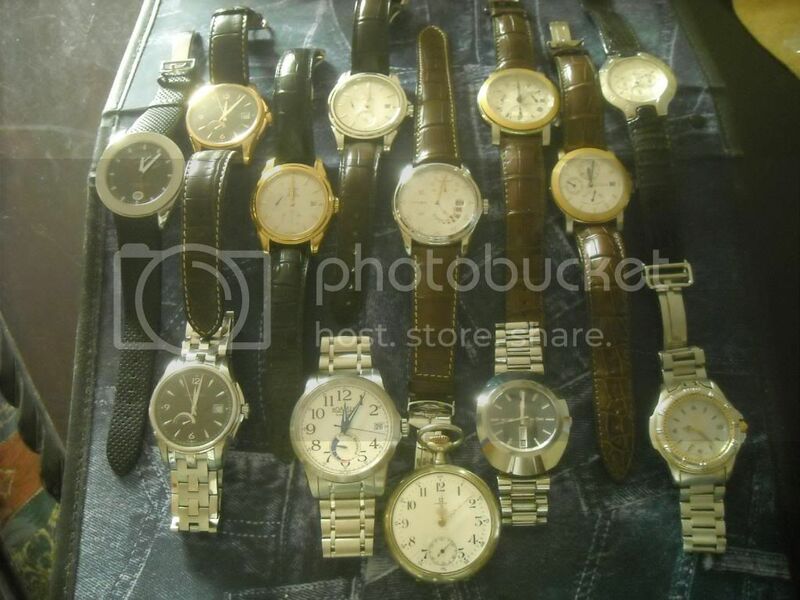 This was my little walk down memory lane of my little watch collection. Have just started new work here 1 december 2009.